Talented young people from across the South West, representing the future of the housebuilding industry, gathered in Filton this week. They were attending Bovis Homes' first South West Apprentice of the Year Award, an exciting new scheme that looks to reward the efforts of those who have taken up an apprenticeship within the company. 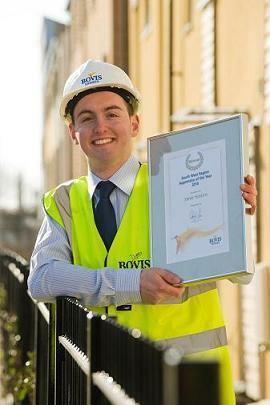 And fittingly the ceremony took place at Bovis Homes prestigious development, Charlton Hayes, a 2,400 home scheme in South Gloucestershire which is the biggest project of its type in the Bristol area for 30 years. The event was attended by youngsters who have taken their first step onto the career ladder at Charlton Hayes itself, and featured apprentices from all areas of the business - including plumbers, carpenters, office administrators and bricklayers - who are all at different stages in their apprenticeships. The awards were presented by Bovis Homes' South West region managing director Malcolm Pink; South Gloucestershire Councillor Matthew Riddle, Executive Member for Community Care and Housing; and Bristol City Council Priority Stock Team, Prefab Redevelopment Project Manager Martyn Pursey. It was also attended by representatives from the Homes and Communities Agency, Sovereign Housing and the South West Regional Development Agency. "These young people are the future of the housebuilding industry and Bovis Homes is committed to giving them all the support and encouragement they need," said Malcolm. "The industry has had some well-documented challenges over the last few years but what remains is a huge need for housing in this country and in the South West in particular - and these are some of the people who will be delivering that. "They are learning skills that should put them on the path to successful and fulfilling careers and we are proud to be giving them a start. It shows our commitment to their development that the families of the apprentices are also here to celebrate their achievements. "Just as first time buyers are the lifeblood of the housing market - so these apprentices are the beating heart of the housing industry, which is one of the driving forces of the UK's economy. We are pleased to be able to help nurture and develop their talents." Councillor Riddle said: "I'd like to congratulate all these apprentices on their awards and for the work they do at sites such as Charlton Hayes, where I've been most impressed by the standard of work. "Developments such as this are vital for our local economy and for delivering the affordable housing that we as a council are committed to supplying for local people." The winning apprentice was 19-year-old plumber Steve Hoskins, who works at the company's Dorian Road site in Bristol, which is part of Bristol City Council Prefab Redevelopment Project, with contractor Gregor Heating and Plumbing. He is in the fourth year of an apprenticeship through OnSite Bristol and lives locally at Horfield having attended St Bede's Catholic College in Lawrence Weston. "The apprenticeship has been a great experience and has really set me on the way to a career in this industry," he said. "I've always wanted to work in this sort of environment and it's nice when your commitment to the job is recognised like this."